I joined eHA, believing the opportunity would help me reach my career goals and sharpen my skill set. I do not regret joining the team. I have always wanted to serve in an organization that would give me the experience I need to begin my career. At eHA, I am able to put into practice what I had learned during my four years at the University and learn new skills. I remember thinking that the procurement unit had so many tasks and processes that I was not conversant with, and was worried that I wouldn’t be able to master them. One of the first things that struck me about eHA was the use of technology to make working more efficient. Technology aids almost all processes, including the signing of documents. I was like; “wow! this is great’’. There was so much to learn. I learned how to use different apps and platforms for financial management, document storage, and even task management. At eHA, I have learned so much in a short time. Now, I know how to execute a procurement process, from bid evaluation to processing vendor payments. I also learned how to do administrative tasks for the procurement department, including organizing procurement committee meetings! All this, within just a few months of starting my internship with eHA. I love the fact that eHealth Africa provides opportunities for everyone to learn and grow in their career and in any other areas of interest. One of my biggest takeaways from eHA is to deliver every task with utmost diligence. The experiences and knowledge that I have gained will be mine for the rest of my life. I am very grateful to eHA. I love working at eHealth Africa! My colleagues ae very welcoming and eager to help. By the third day of my internship, I quickly realized that there was no need to worry because my supervisor is very inspiring, hardworking and patient with me. She trained me one on one, for a week, so that I would be accustomed to how things are done in the procurement unit. She encouraged me to ask questions and to seek clarification whenever I was unsure of something. It’s true, no one treats me differently, even though I am an intern. We are included in all aspects of the organization and our work is just as invaluable as any other team members’. There’s no sense of “real staff” vs. “interns”, we are all one team. 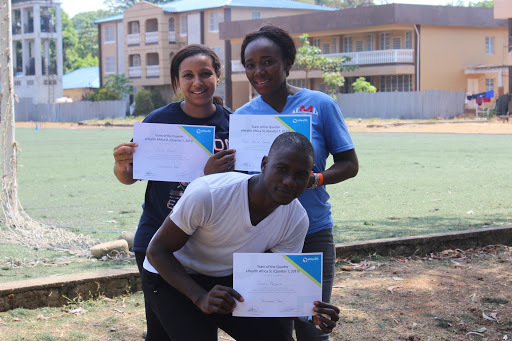 For example, the procurement team in Sierra Leone was commended for being the Team of the Quarter, during an employee event on 29th of March 2019, marking the end of the first quarter. Are you interested in applying for an internship with eHA? Click here to see the list of open internships and apply now.